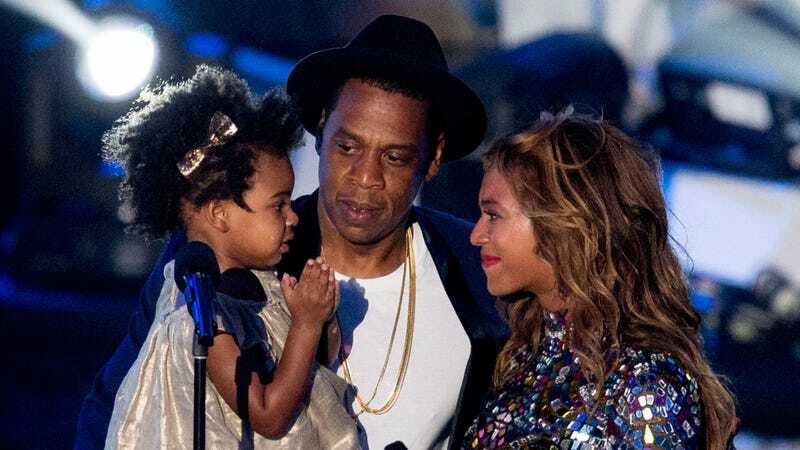 Blue Ivy Carter, Jay Z and Beyonce onstage during the 2014 MTV Video Music Awards at The Forum on August 24, 2014 in Inglewood, California. Some of y’all should’ve just sat there and ate your food. You know who you are; those of you who had so many opinions about a toddler’s hair—and so many judgments about her mother’s choice to let it grow and flourish naturally that the woman had to address it in a damned song lyric. Well, guess who has the last laugh now? Personally, I don’t know a woman (or a few men) on a natural hair journey who wouldn’t love a head full of thick, thriving curls like Blue’s. This is a follicular triumph, y’all. Many rightly considered it karmic retribution for those who’d once tried to impose their respectability politics on the child’s head—and the clapback was skrong on social media. Taking the moment of crowning glory further, Bey posted a fan-created side-by-side comparison of her and her eldest daughter at age seven, proving that magnificent manes run in the Knowles family—and that Blue may just be beginning to blossom into a beauty that may one day rival her mother’s. So, let this be a lesson to the self-anointed hair police to mind their own business and their own children’s follicles. Because see what happens when you leave well enough alone?